One of only three known examples, this map marks a major milestone in the urban mapping of Philadelphia, and is one of the first to show Fairmount Park's design. New Map of the City of Philadelphia, reduced by Photography from a large survey made expressly for the City and corrected from Plans and Draughts in the Department of Surveys, by John. H. Dye, Draughtsman and Surveyor. 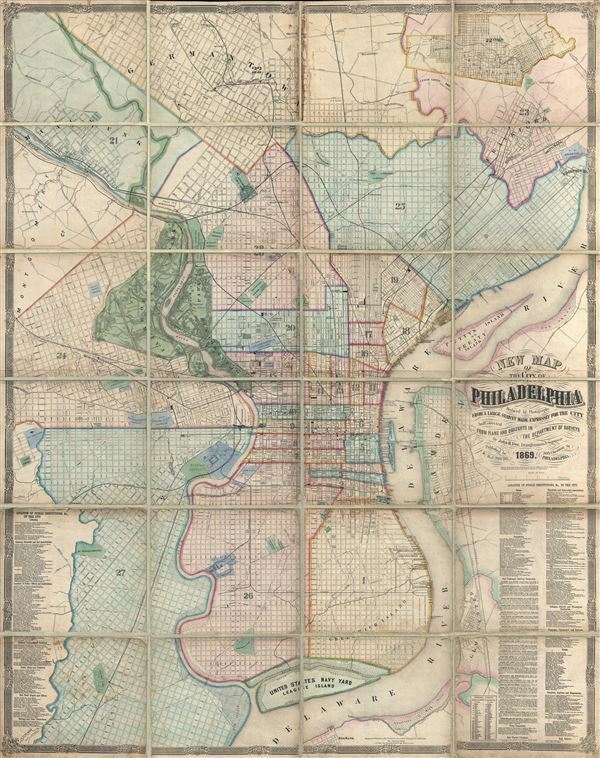 An exceptional 1869 folding wall map of Philadelphia, Pennsylvania by John H. Dye and Henry J. Toudy. This map covers the urban center of Philadelphia along both sides the Delaware and Lehigh Rivers from roughly Germantown to Red Bank and from Haddington to Camden. The map's extraordinary detail and large scale enables it to show every single street, alley, waterworks, public building, cemetery, railroad, and park then extant. Tables to the right and left of the map proper identify countless public institutions ranging from libraries to offices, banks, government institutions, military installations, hospitals, colleges, asylums, dispensaries, ferries, safe deposit companies, railroad companies, and benevolent associations, among others. Thanks be and are hereby given to Messrs H. J. Toudy and Co for the large and useful Map of the City presented by them. In so far as we can tell, Dye and Toudy never promoted or offered their map publicly, making it exceptionally rare with only two other examples known, one in the Huntington Library and other held by the Bibliotheque Nationale de France. This is the only known example to have ever appeared on the public market. Henry J. Toudy (fl. c. 1857 - c. 1877) was an American lithographer, engraver, and map publisher active in Philadelphia during the middle part of the 19th century. Little is known of Toudy's parentage or early life, but he established a steam lithography press in Philadelphia around 1856. Toudy was best known as a printer of city and town views, with many such productions bearing his imprint. He also published portraits, railroad bonds, stock certificates, and map. Toudy's original offices were located at 503 and 505 Chestnuts Streets. Insurance records suggest that Toudy's Chestnut Street offices were gutted by fire on March 25, 1879. Records suggest that the Toudy firm was reestablished in 1884 at 829 Walnut Street. In 1892 a Henry J. Toudy is recorded as the owner of the Greenback Coilliery, a mine in Shamokin, PA famous for a terrible explosion that had occurred years earlier under another owner. It is unclear if they are the same person or possibly related, but such is neither unlikely nor impossible. John H. Dye (September 9, 1833 - 19??) was a Philadelphia based draughtsman, government official, surveyor, and mapmaker active in the middle part of the 19th century. Dye was born in Kensington, Pennsylvania, to which his parents William and Christiana Dye migrated after leaving Rhode Island. Dye studied civil engineering under James P. Davis, his uncle, and took a position under Strickland Niece, chief engineer of Philadelphia. In 1865 Dye was appointed to create and manage the Registry Bureau of the Philadelphia Survey Department, a position which he held for 31 years. The bureau, under Dye's direction compiled and sold Philadelphia city and district plans for both official and public use, these included civic improvement, legal matters, land purchase and sale, cemetery management, and the construction of the city's sewer system. Dye served as a Union officer in the American Civil War. He was also active in his local Masonic Lodge, where he attained the 32nd degree of the Scottish Rite. Later, in 1885 he was elected Chair of the Engineers Club of Philadelphia. Die was active until at least 1896. The date and place of his death is unknown. Dissected and mounted on linen. Map exhibits full professional restoration and some discoloration from older glues. Huntington Library, 093:575 M. OCLC 495093079.